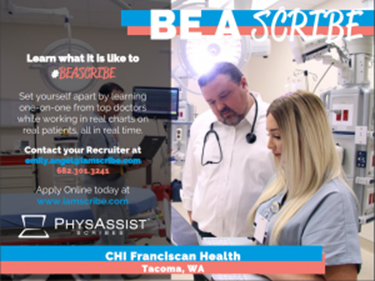 PhysAssist is currently scheduling interviews for part-time and full-time positions at the Tacoma and Centralia sites. Scribe America hires and trains Medical Scribes for hospitals, urgent cares, and outpatient clinics. Scribes work alongside physicians by assisting with administrative tasks and various duties – gaining first-hand experience in a medical setting and earning clinical hours. Becoming a Scribe provides the student with direct exposure to medical terminology, disease processes, emergency procedures, medications, and the medical decision making process performed by the physicians. Please feel free to visit our website to learn more about ScribeAmerica. You are also welcome to contact me directly with any questions you may have or to set up a meet-n-greet with you and your students.